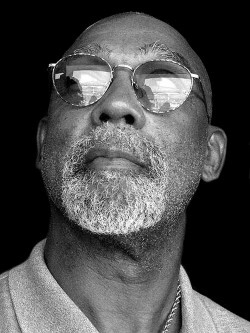 John Carlos, whose gloved left fist left far more of an imprint on society than the ones swung rather more violently by Mike Tyson, will make a rare and welcome visit to England in May – thanks to an SJA member. Along with his biographer, David Zirin, Carlos will deliver the Annual Sports Journalism Lecture and attend the Student Exhibition at the University of Brighton on May 16. On October 16 1968, Carlos and fellow American sprinter Tommie Smith used the Olympic 200 metres medal ceremony in Mexico City to make an important and indelible statement about racism. 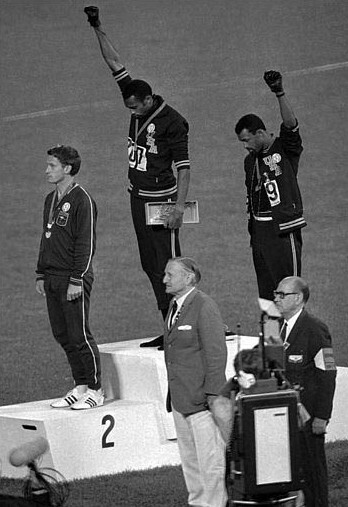 It was the athletes’ “Black Power” salute – black gloves, black socks, civil rights badges, Smith’s black scarf – that was instantly enshrined as the moment the pretence belatedly ended; the pretence that politics and sport were not indivisible. It also proved a high-point for the Civil Rights movement: Carlos and Smith, bronze and gold medal-winners respectively, had brought the poverty of black Americans to the world’s attention. Their immediate reward was to be sent home, where they were assailed by a succession of death threats. Shortly before Christmas 2011, Zirin, the campaigning American sportswriter whose biography of Carlos, The John Carlos Story: The Sports Moment That Changed the World, was published by Haymarket last year, emailed SJA member Rob Steen, now senior lecturer in sports journalism at the University of Brighton’s Chelsea School of Sport. He wanted to bring Carlos to England in Olympic year, but needed funding. Rob persuaded the college to fly the pair over. “To be honest, the college didn’t take much persuading,” Steen said. Now 66 but still a redoubtable activist, Carlos turned up at Occupy Wall Street last October, delivering an address and hoisting that fabled fist. In 2008, he and Smith accepted the Arthur Ashe Award for Courage for their salute at the ESPY Awards. In the same year he participated in the Human Rights Torch, which ran parallel to the Beijing Olympics torch relay, drawing attention to China’s lamentable record on human rights. Any SJA members wishing to attend the Annual SJ lecture, or requiring further details, please contact Rob Steen at Robmsteen@aol.com. Numbers are limited (student journalists come first! ), so let him know as soon as possible to avoid disappointment.